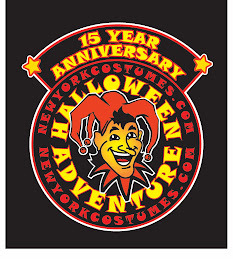 NewYorkCostumes.com 212-673-4546 Halloween Adventure Union Square: SantaCon is coming to town. What to wear?! SantaCon is coming to town, and sooner than you think! For this wild street-roving spectacle of Santas, what's a well-dressed Chris Kringle to wear? The key to Santa style is, as with all splendid attire, the basics plus the right accessories. Basic Santa suits come in a variety of materials. For example, there are flannel Santa suits, plush Santa suits, velour Santas suits, and even velvet suits. All of these give you your basic color scheme and shape: red jacket and pants trimmed in white fur (most often faux fur), red hat trimmed in the white fur, and a nice wide belt. Some suits come with Santa boot tops as well, which is a plus. For those of you Santas on a budget, consider the economical complete Santa suit made of felt. It makes a great low priced Santa suit option. But where do you go from here? Accessorize! What first? The beard! There's always the classic white Santa beard, which often comes with an accompanying white wig. But if you are looking for a Santa beard that only slightly defies the expected, there are Uncle Sam beards for a slightly pointier look and Super Deluxe Santa beards for a really full-coverage type mega beard effect. Then there economy Santa beards, often called the "Xtra Long Beard and Moustache," which give the basic Santa beard look. To deviate a bit from the "classic" Santa beard, there are beards in colors other than white, of course! A slightly younger looking Santa might go for a Character Beard in light brown or grey, or even a blond full coverage beard. And a more WILD Santa would be well suited to have a spiky Caveman beard and wig! Furthermore, there are Abe Lincoln beards to consider, thick and curly black beards, and even pirate goatees and mustache sets, for a really non-traditional look. Once you've got your Santa facial hair under control, you can look to other important accessories. Gloves make a great addition. White polyester gloves provide one simple option, as do white nylon snap close gloves. There are also the classic black leather-looking gloves with cuffs. And for funkier Santas - whom we see especially during SantaCon! - there are black studded leather-looking gloves, Glow in the Dark Skeleton hand gloves, and even gloves that look like black hairy monster hands! For read ing those lists of wishes, Santa glasses come in handy. Ben Franklin glasses make great Santa glasses, with their golden square frames. Character glasses with round frames offer another basic option for Santa Claus attire. For the cool-kat Claus, there are funky sun glasses in any variety of shapes and sizes. Other splendid accessories include boot tops, as mentioned above, for those Santas who don't have tall riding boots of their own. The belt is another biggy to consider, and not just because most Santas have considerably waist-lines! How big will your buckle be? And what color? Will it be a belt with the classic gold buckle? Or maybe a belt with the buckle in black? Or maybe you'll forgo the belt and jacket and go with Santa suspenders instead? And the hat! You can't forget the classic Santa head covering red fur trimmed hat. There are basic Santa hats, for Santas on a budget, and there are fuzzy Santa hats in the same red and white color scheme. From there, there are Santa hats in colors other than red, ranging from blue to green, to camouflage even. Once you've got your basic suit and accessories taken care of, you can take your Santa Claus even further, if you like. Biker Santas, plumber Santas, pirate Santas, and even gorilla Santas are all entirely possible to help make your SantaCon crawl into an even greater spectacle. The sky's the limit, so get on your sleigh and get out there to see what kind of Chris Kringle costume you can put together for this year's festivities! Because ready-to-wear wigs tend to contain more hair in general, many women opt for a wig two shades lighter so that it looks less 'heavy' and more realistic. Red lace front wig Wigs were also used as an everyday fashion in other ancient cultures including the Asyrians, Phoenicians, Greeks and Romans. New Years Eve 2010 - Celebrate in Style! Moustache Party? All the Rage!